We expected lots and lots of new riders in 2016, but we aimed rather high, a “stretch target” as CEO Andy Byford described it. They didn’t all show up. This led to a shortfall both in ridership and in revenue compared to the original 2016 budget. Service improvements were planned for fall 2016 based on the target numbers, but as there are fewer riders, the improvements were not required. 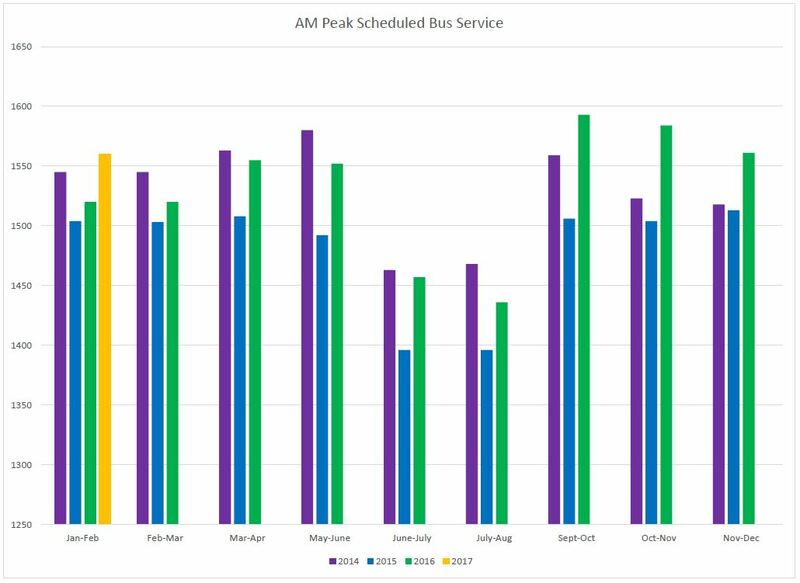 Ridership for 2017 is projected to be only barely above 2016 levels, and the service operating in fall 2016 is adequate to handle the demand. There is no provision in the 2017 budget for service increases beyond the full-year effect of changes made partway through 2016. All of this is quite plausible, but it runs headlong into conflicts with other factors. 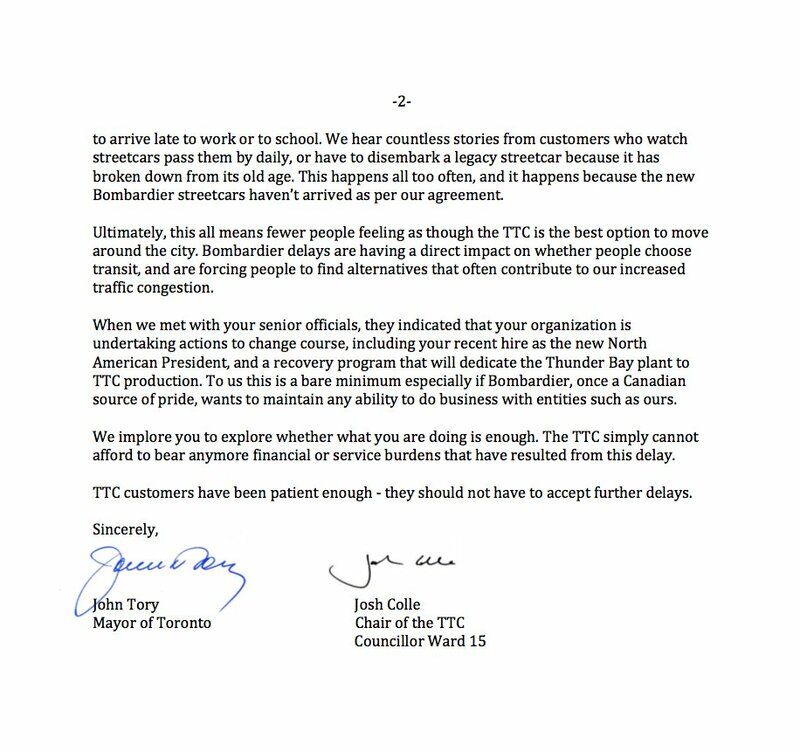 The most recent of these is a letter from Mayor Tory and TTC Chair Josh Colle to Bombardier complaining about the late delivery of streetcars. This letter informs us that the quality of TTC service is affected by the availability of the streetcar fleet, and in turn, of the bus fleet which has been partly diverted to serve streetcar routes. The letter is quite clear in saying that crowding results from diversion of buses to the streetcar routes, and from a lack of reliable streetcars. That is not the same thing as “we don’t need any more service because there isn’t enough demand”. Indeed, even if the TTC had a larger reliable fleet, it would have no money in the 2017 budget, nor available headcount (i.e. authority to hire more drivers) to bring these vehicles out onto the street. The vehicle shortage and Bombardier’s late deliveries are actually helping the TTC and Mayor Tory impose his limits on service expansion. Without them, he would have an embarrassment of idle vehicles. We have seen this problem at the TTC before where attempts to improve service (the Ridership Growth Strategy under Mayor Miller) were thwarted by a shortage of vehicles and operators. TTC management plans to bring an updated RGS to their Board in January 2017, but unless both the Board and City Council approve funding and staff, nothing can happen during 2017 except by shuffling service from one route or time period to another. This is “fine tuning”, an exercise in “efficiencies”, not a commitment to a broad-based improvement in service. If routes are overcrowded, the first thing the TTC owes everyone is a detailed list of when and where this is taking place. How many buses and streetcars are we really short of requirements, and if they were available, what would be the budgetary effect simply of getting up to the service standard set by the Board? If we are already at this standard, how can Tory and Colle claim that crowding is the result of a vehicle shortage? One big problem with crowding is that, beyond a certain point, it does not really measure demand. How many people could not get on because a bus was full? How many people gave up and walked or hailed a cab because their streetcar never showed up? Budget hawks whose attitude to transit roughly equates to “there’s always room for one more on the roof” ignore this problem of latent demand and abandoned attempts to ride the TTC. They would rather talk about how there must be even more money the TTC can wring from its operations to avoid higher subsidies. They don’t see the taxicabs trolling major routes for fares whenever there is a gap in service (they’re not hard to find) and picking off would-be TTC customers. How Is The Bus Fleet Used? In the case of 501 Queen, the number of buses is driven by the need to break the line at Roncesvalles for construction. If not for this project, it is unclear just how many streetcars would actually have to come off of the route to fit with maintenance needs of the old cars. Many other routes such as 7 Bathurst and 29 Dufferin are affected by Crosstown construction, but the schedule adjustments have simply stretched the existing service over longer trip times (and hence wider headways between buses). This increases crowding because the number of buses per hour past any point is reduced. Other projects such as the Spadina subway extension, the Renforth Gateway, the Six Points, not to mention the shortage of working trains for the SRT also contribute to the total of extra buses on various routes, but not at the scale caused by the streetcar shortage. According to the TTC, all of these routes will remain within the official crowding standards even with fewer buses. I leave it to riders to comment on whether there actually is any room to spare on these routes today. Another matter is the question of service reliability which has been examined many times on this site. Vehicles commonly operate in pairs (or only a few minutes apart) with the result that the average condition seen by most riders is the crowded first vehicle, not its roomy follower. TTC stats might report that service meets standards on average, but most riders are not on an “average” bus or streetcar. This is a long-standing problem with Toronto’s transit service about which the TTC does next to nothing if actual conditions on major routes are any indication. Finally, it is worth looking at the scheduled service over recent years. The drop in scheduled buses between 2014 and 2015 results from the introduction of larger 18m vehicles which displaced the regular 12m buses on a 3:2 ratio on affected routes (roughly equivalent to a 60 bus reduction). The effect had largely worked its way into the schedules by fall 2014, and so the difference between 2014 and 2015 is not as marked later in the year. 2016 saw the introduction of vehicles from the order delivered in 2015, although the rise in scheduled vehicles is considerably lower than the size of the order. Based on a 105 bus order, one would expect about 88 more scheduled vehicles for 20% spares. This level of change is visible only in fall 2016, and service cuts plus redirection of buses to streetcar routes have undone much of the benefit. These are the new buses announced in the Tory/Colle press conference early in 2015. The peak scheduled bus count in January 2017 is the same as in November-December 2016. It is only 3.7% higher (56 buses) than the count in January 2015. 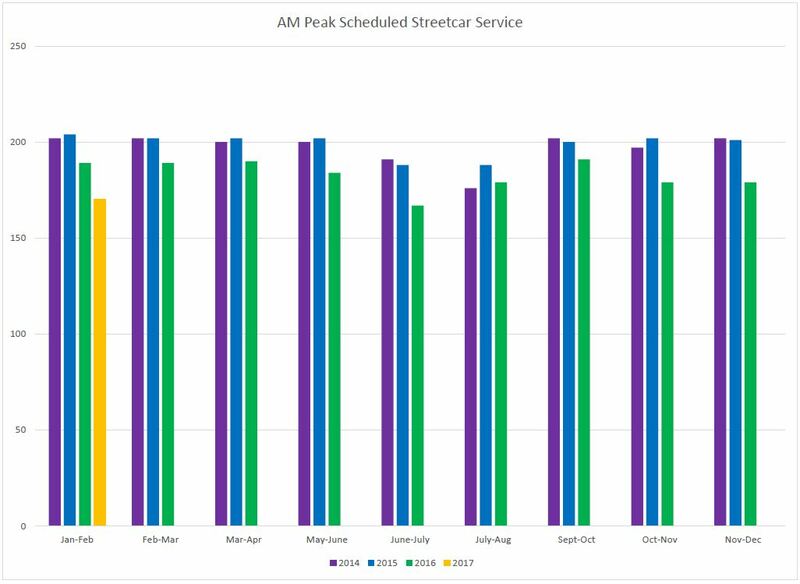 As for the streetcar service, the number of peak vehicles stayed fairly constant until 2016 when it began to drop. A small part of this is due to the introduction of larger vehicles on 510 Spadina which now has fewer new Flexitys serving it than in its days with CLRVs. The main reason for the drop is withdrawal of streetcars from service for maintenance and reliability. In summary, yes, the TTC bought new buses early in the Tory administration, but the full increase in fleet was only briefly seen on the street, and this has now been reduced by a combination of service cutbacks and redeployment of buses to streetcar lines. During his election campaign, John Tory’s position was that everything was just fine with transit service, that more buses or streetcars were not a solution to anything, and that his SmartTrack plan would solve every problem. It was a very big chicken that would fill every available pot. Today, SmartTrack consists of six new GO Transit stations that will be built on the City’s dime, plus the western extension of the Eglinton-Crosstown LRT to Renforth Gateway and, maybe, to Pearson Airport if someone else will pay for that part of the route. Gone is the surface-subway frequency of trains from Markham to Mississauga and all that this would imply for a transformation of the rapid transit network. Gone is a service that might carry hundreds of thousands of riders daily. All that remains is election souvenirs and the signature SmartTrack colours. Shortly after taking office, Mayor Tory and Chair Josh Colle held a press conference to announce that, goodness gracious, the “previous administration” had made unconscionable cuts to the TTC and taken service away from people who really needed it. This about-face compared to his election stance was a pleasant surprise, but it brought nowhere near the resources one might expect to see on the transit system. A promised investment of $95 million turned out to be roughly half that amount once other cuts to the TTC’s budget were taken into account. The TTC is buying new buses ostensibly for more service, but does not have the budgeted resources to operate them. On the heaviest streetcar line, 504 King, the TTC talks about adding more capacity by running buses on the route, but in fact the buses only barely offset the capacity lost because streetcars have been removed. The capacity actually provided on King has not changed in years, and even this is subject to periodic disruption for events where transit takes a back seat to other civic priorities. Lest all of this appear to be an anti-Tory rant, Bombardier is no saint in this story either. They have been promising new cars but failing to deliver for a long time, and as TTC CEO Andy Byford says, “we have more schedules than streetcars”. The mess with fleet availability can be traced directly to the delays in manufacturing the new cars thanks to quality control problems that have been well documented elsewhere. The fact that the TTC is now seeing several new cars in a short period is good news (the planned 30th car is enroute to Toronto as I write this), and Bombardier will hit its oft-revised target for the end of 2016. We will, however, still be 70 cars short of where we expected to be by this time. Forty more cars are expected in 2017, but the system will still depend overwhelmingly on the remaining fleet of old cars. The CLRV fleet (the single section cars) dates from 1977-81 while the ALRV fleet (two-section cars) were delivered in 1987-89. The CLRVs are well beyond the normal 30-year retirement age for a rail vehicle, and the ALRVs would wave their farewells in the next few years. Instead, the TTC shops are working to rebuild enough cars to keep some of the fleet in reliable shape while awaiting the rest of the Bombardier Flexitys. In 2018, Bombardier says it will provide 76 new streetcars to the TTC and 58 in 2019. TTC staff says that works out to a rate of approximately one car every 3.3 days in 2018 and one every 4.4 days in 2019. When Toronto first looked at replacement streetcars a decade ago, their first target was a vehicle with a low centre section (about 70% of the car) and two high-floor end sections. (A mockup based on Bombardier’s design for Minneapolis was displayed at Dundas Square in mid-2007.) This would have provided accessibility to a limited part of the car, but at the expense of internal circulation problems thanks to having two separate floor heights. When the Berlin 100% low floor design came along, the TTC switched direction. That change cost some time early in the project, and this was compounded by the failure to get an acceptable bid in the first round. By the time a second round was in, only two bidders remained (Bombardier and Siemens), and Bombardier’s price was much lower than Siemens’. The contract went to Bombardier in mid-2009, and at that point completion was scheduled for mid-2018. After three prototypes, the first production vehicle was to arrive in 2012. This would allow a comparatively relaxed production rate over six years, but production delays have compressed this to a much shorter period even with the end date now in 2019. Even the 40 cars for 2017 is a rate only one third above the originally planned 30/year and this will leave 134 to be delivered in 2018 and 2019, more than double the originally planned rate. Bombardier builds a range of vehicles over the entire rail spectrum, and wouldn’t have arrived at this position by failing to deliver on their contracts. Indeed, even in Toronto, Bombardier has churned out subway cars for years with some teething problems, but no reason to expect they were incapable of delivery. This history makes the streetcar problems even more troublesome because they were so unexpected, and they came at a time when the company was preoccupied with the survival of its aircraft business. Bombardier has reorganized its production capacity not just for the TTC order, but for cars destined to Metrolinx LRT lines as well as Kitchener-Waterloo’s ION LRT. Plants in both Kingston, Ontario and La Pocatière, Québec have become part of the LRV manufacturing process. The overall status of delivery schedules for orders beyond the TTC remains a mystery. Will Huffing and Puffing Get Toronto More Service? 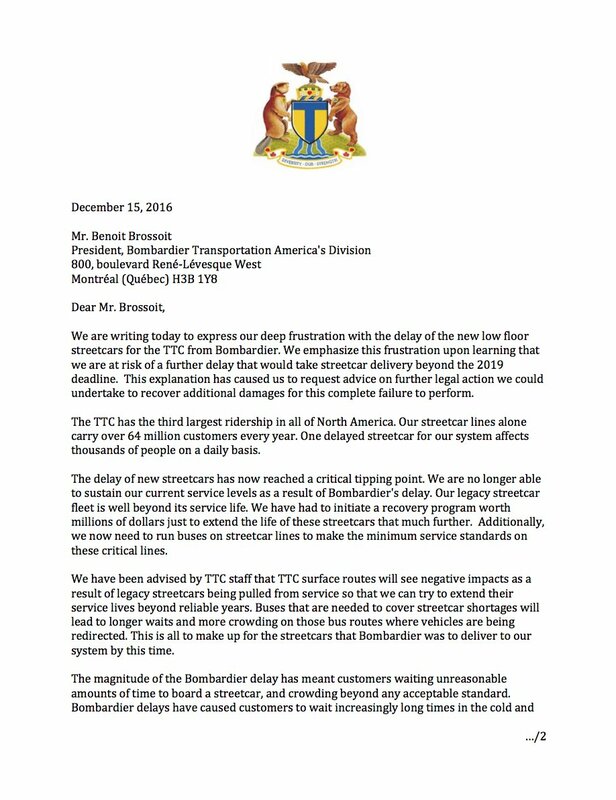 Mayor Tory’s letter to Bombardier is timed intriguingly to land just before the City’s Budget Committee will review TTC financial plans for 2017, and during a period when demands for better service are commonly heard. If anything, this is a diversionary tactic to say “we couldn’t run more service even if we wanted to” and thereby avoid any debate over funding transit improvements. This could well pre-empt even a discussion of what might be needed and what could be done, a typical Toronto transit situation where any real discussion of improvements is sandbagged. Meanwhile, fantasies of new subway lines dance in Councillors’ heads at a cost both directly in borrowing and debt service, and indirectly in the works that never get off of the drawing board for lack of funding. Holding down property taxes is a holy grail to the Mayor who insists on across the board cuts to spending even when the effect is to undo many of his own promises. All of Toronto’s (and Ontario’s) capital spending on transit puts the City and the TTC on the verge of substantial increases in operating costs for day-to-day service. Rapid transit is more expensive to operate than the bus routes it replaces, and higher frequency trunk lines attract more riding on feeder routes. Any fare consolidation with GO Transit under the rubric of “SmartTrack” or “Regional Integration” will almost certainly mean additional subsidies for Toronto’s riders. Will these costs be borne from City revenues, or will riders pay for them with higher fares and service cuts? This is vital financial planning, but the area has been utterly ignored by Toronto’s politicians for years. Recently, Mayor Tory has taken a new, combative position saying, in effect, that nobody before him on Council lifted a finger to improve transit. This is a remnant of “SmartTrack as cure-all” from his campaign days, and it does much disservice to those who fought through the Ford years to limit the damage to the transit system. Those who fight the good fight do not always win, but that failure is far different from inaction, and just keeping issues in the public eye has long-term benefits when political winds change. The real issue before Council with the 2017 budget is that transit needs better funding, and that there are serious questions about the adequacy of transit service. Trying to shift all of the blame to Bombardier denies the very real problem that service out there on the street is not meeting riders’ expectations and needs. A productive discussion would find out just how badly behind those needs the TTC really is and work out a way to solve this problem. That would make a great start for a re-election campaign in 2018. Making transit work better now, not in a decade’s time. But instead, we will hear all about saving precious taxpayers dollars, building new subway lines, and nothing about improving the transit service riders face every day. Joe has a very good understanding of the frustrated commuter. While he is “outer 416”, I am “outer 905”. By necessity I drive to Toronto. I would like nothing more than to be able to switch to public transit at the first opportunity. My journey usually consists of “drive, park & walk”. Over the past few decades, Toronto’s car population has exploded, and commute times are double from before – no exaggeration. I must plan for two hours to get to mid-town TO, 5 am to 8 pm. I come into Trawna from the northwest. Just in the past week I have talked to several Bolton-area residents, and we are all 100% for an LRT from Bolton to the Airport, and from there to connect to the TTC. Up here, we drive by necessity. And, suppose I left my car in a transit parking lot. I do some shopping in Toronto, so now where do I put my stuff? How about a service to deliver my parcels & bags to a locker at the lot where my car is at? I remember when I was a kid, we lived in the central west end (Christie St.). My Mum shopped at Eaton’s, and they delivered it to our home same day! Unfortunately, driving in from out-of-town usually leaves me driving my whole trip, as transferring to public transit is inconvenient, and there is an incremental cost (time and money). But, I have to wonder, not all of these cars are from the 905? People in central Trawna are keeping SUV’s in their driveways, and using them all the time to get around. Way back, people could not afford cars, which is why pre-1960’s Toronto was built around a transit-based street planning model. So, today, despite infill condo projects, vehicular traffic in TO just gets ridiculously worse. Today, when a household in central TO weighs the costs and convenience, they decide on an SUV in the driveway or parking spot. Those who cannot afford either a driveway or an SUV are stuck with TTC. It is obvious that the pricing and taxation versus convenience of private vehicles is such that it is most often the preferred option even for central TO residents. Meanwhile, public transit is grossly lacking in service levels and routes. Perhaps all future condo projects in TO disallow parking? What remains of Transit City is all that should remain. Aside from the usual select few inner City Politicians and media associates, the appetite to poorly integrate Scarborough Center has thankfully passed. Sure its beyond disappointing the SSE is lacking multiple stops but as far as Scarborough Center is concerned its far more effective then the RT or SLRT could ever be. So lets move on. Its time to tax, lobby and move forward to stop the nonsense. The whole City is overdue with serious transit needs and any talk about “priority” is just keeping the discussion in a divisive state. All the unfunded projects tables are beyond “priority”. Its inexcusable that any key areas in the City get be left behind in the next wave or half to wait to have their needs met without moving with priority. The plan is not perfect but is pretty damn good if with we can actually deal with the real issue of taxation, stop fighting to cut corners in the plans, and get building. Joe M says: It’s inexcusable that any key areas in the City get be left behind in the next wave or have to wait to have their needs met without moving with priority. Unfortunately, all our capital has been wasted on a vanity project designed to meet a sense of aggrievement fuelled by an irresponsible politician. It is going to take all the rest of Toronto – Jane and Finch – Thistledown – Malvern – St. Jamestown and yes downtown and mid-town – 30 years to pay off an unnecessary and wasteful subway to Scarborough Town Centre. The distance of this one stop subway is the equivalent of Kipling to Jane – and it will never carry the traffic that exists now or in the future from Kipling to Jane. Much of the traffic from Kipling to Jane is local. This will never happen on the wasteful Scarborough one stop boondoggle. The right answer for travel from the Scarborough Town Centre always was and remains LRT. This solution (as Steve points out) was the correct one in the time of Mr. Davis and is also the right one today. Transit priority should always be based on volume of traffic – not on some idea about self assessed deservingness. The reality is that lots of areas of the City are being left behind. I agree that we need to raise additional taxes in Toronto and that a good project would be improving transit outside the Scarborough Single Stop Subway Boondoggle. However, tax increases in Toronto are politically difficult. The transit improvement available to the vast majority of Torontonians – outside the Cadillac solution offered to a select and selfish group – will be elusive. I live downtown. It is not practical to offer higher level LRT transit in this area. Every time I ride the reserved ROW streetcar on Spadina I feel very privileged. An LRT in my neighbourhood would be nirvana – not an insult. I rarely use the subway. I am very far from an elite – just a citizen. Joe M. writes: …. the appetite to poorly integrate Scarborough Center has thankfully passed. Sure its beyond disappointing the SSE is lacking multiple stops but as far as Scarborough Center is concerned its far more effective then the RT or SLRT could ever be. Why is Scarborough Town Centre deserving of a subway? In other discussions, I believe you have said that the growth of STC has been stunted or prevented by the poor transit provided by the SRT. Are we discussing how best to provide better transit to Scarborough residents, or are we discussing ways to give STC the growth and connections that it “deserves”? Because the two are quite separate things in my mind. A subway to STC will most benefit landlords and developers in the immediate vicinity of the STC. I am not sure why this should be of concern to anyone who isn’t a landlord or developer. You keep bringing this up. Are you a landlord or developer or a representative of one? A more rational discussion would ask, if we are indeed extending the subway further into Scarborough, where is the best route? I suspect that, both from the point of view of increasing the usability of transit in Scarborough, as well as from a cost/benefit view, it may be elsewhere than STC. 1. A subway stop does not automatically create growth around it. There’s nothing happening at Warden and St. Clair (a stop that I use often enough to visit someone at Providence Health Care just up the road), nor at Kennedy and Eglinton (which seems to be a logical place for a major growth node). 2. If developers are seriously motivated to build somewhere, the absence of a subway will not be a deterrent. I urge anyone in Scarborough to come to “Humber Bay Shores”, just west of the Humber, around Lake Shore and Park Lawn. There is an insane amount of development going on in the area, including multiple 50+ storey towers — something I don’t see at all around STC. Yet there is no subway stop anywhere in the area; transit users are stuck riding either a local bus route to a subway station, or an hour ride on the streetcar downtown. An SRT-type route would be a huge improvement in transit connectivity, so what is STC complaining about? Why would we want to spend $3 billion or $4 billion or whatever in the hope that developers will suddenly start to see STC as a desirable place to build? 3. The Sheppard subway shows the folly of building a major transit route that ends at a regional shopping mall. The shopping mall adds pretty much nothing to ridership, while making development around it that much harder. Shopping malls are surrounded by parking lots. The only way the parking lots are going to go if the shopping mall is gone. If a parent living in the City’s lower income suburban area doesn’t carry a high paying job and lives close to their job that shouldn’t mean their kids should have to suffer through insufferable commutes to gain access to City’s main job areas. This City needs to build bridges and open up congestion for all residents. There is a strong myth based on “facts” that residents of our public transit desert suburbs don’t come downtown. It’s because the commute is unreasonable by all modes and most people can’t just move for many reason. This is reasonable. In no way does it prove that STC is the logical terminus for a subway extension. Michael Greason: Unfortunately, all our capital has been wasted on a vanity project designed to meet a sense of aggrievement fuelled by an irresponsible politician. The real issue is the City and upper levels of Gov’t haven’t provided proper capital to build a network whatsoever. Having limited capital is no excuse for hacking a transit design into Scarborough. I could get into a long winded response about SCC but at then end of the day it’s already built up more than most areas of better transit and development has only stalled because of the transit confusion. It also has lots of room for growth. The SSE is only one part of what needed in Scarborough future. The real issue is funding and making it a blanket subway vs. LRT or vs. any other technology is nonsense. I’m all about connecting key areas in the same manner as what exists in this City(and currently growing into empty fields of the 905). SCC is already built up more than most current subway locations in the City with tons of room for growth. Now let’s get on funding projects in the rest of Scarborough and the City. Which is the only serious issue. Joe M, if I had to believe either you or the evidence of my own eyes of what is happening all over the city, I’d have to go with my own eyes. If the shopping mall part of SCC went away, there’d be nothing of any significance there. And I’m not about to support a subway to a shopping mall. Obviously our opinions will have to differ on this. Ed. Joe appears to not appreciate the idea, that rapid transit closer to more doors, would have a larger effect on overall trip time. I understand his view, simply because the TTC seems to only manage headway reasonably – on subway. If the TTC worked harder at dispatch on other systems, and Spadina and St Clair were not the only examples of LRT he could really refer to, he might see it differently. Part of the issue with LRT, is the massive range of things the name has been used on, and well, speed, stop spacing, and headway management are all really important, and if you do not think the TTC will manage the balance well, it becomes a massive risk. The mall, spattering of offices and existing condos are a lot more than what most of our existing stops had when they were built. Actually there is more than most current stops. And its a very important area to the future of this massive suburb. So the false narratives slung around the blog that Scarborough Center is just a mall with no room for growth, or is surrounded by bungalows is utter nonsense. This is a very important bridge based on what infrastructure exists and its very important how we integrate the most neglected, poorly promoted suburb in Greater Toronto. But if cost is all that matters when building in Scarborough than keep up the good fight to keep people divided.